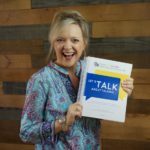 In my new book Let’s Talk About Talking… Ways to Strengthen the 11 Skills All Toddlers Master Before Words Emerge, I teach you how to target pre-linguistic skills that establish the foundation for communicating. Before any kid begins to talk, he’s mastering these distinct skills. When any one skill is disrupted, there’s likely a language delay. When several are missing, a stall in language development is inevitable. When a child struggles to attain many of these skills, a long-term communication disorder is likely. Learn what to do to get these all-important areas moving along! In Part One, you’ll read a discussion of expressive language development so you can know what’s normal. This is important for parents who are wondering things like… Is this a big deal? How far behind is my child? Should I worry? Part One also includes a summary of each of the 11 skills and guidance for deciding if a child has met the skill. You’ll also read suggestions for selecting goals. In Part Two, you’ll find an entire chapter devoted to each of the 11 skills. A description of each skill, including what it looks like when each skill is present and what it looks like when each skill is not developing in a late talker. This information will help you decide if this is an area where your child struggles. A summary of how this area typically develops. This section alerts parents to any differences in their child’s history that they may have This information often helps us pinpoint where (or when) the initial breakdown occurred. A brief section explaining what a young child will continue to struggle with as he gets older if there’s no real improvement in this area. This provides the “big picture” for parents who may not realize the significance of delays in these foundational skills. An explanation for why the skill is important for language development. This section ties each skill to what parents of late talkers want most… to hear their child talk! Ways to know when a child is developmentally ready to target the skill. This section includes the prerequisite skills a toddler should achieve before beginning to work on this area. In other words, this section will help you decide if this skill is a realistic goal. If a late talker has not met the prerequisites for a skill, don’t waste time working on something that’s too hard for both of you. Back up and work on those prerequisite milestones to ensure success before tackling this skill. A comprehensive discussion of my very best strategies for strengthening each skill. These are the things that work to help late talkers! If you’re a therapist, this section can be your treatment plan for working directly with a child or the strategies you’ll recommend (and model!) as you are coaching families. For parents, this section is a guide for what you should do with your own child. No matter what your role, there’s no guessing or wondering if you’re addressing the right things. This is exactly what everyone should be doing to improve each specific area. A list of recommended materials and activities for working on each skill. At least 7 to 10 (sometimes more!) activity pages for my favorite play routines to address each skill. You’ll find step-by-step instructions in the section called “How to Play and What to Say.” Therapists can copy these pages to share with parents for follow-up and home programming. Troubleshooting tips with additional ideas to try if you’re not seeing progress. Don’t move on or give up without reading and implementing the ideas in these sections for each skill! A section with further recommendations to pursue if there’s little to no improvement despite your best efforts. A brief summary of “what comes next” in the continuum of language development. Once a child has mastered the skill you’ve worked on, then he’s developmentally ready to move on to these next few skills. Sometimes the skills are not quite as “sequential” as we’d like and it makes more sense to move on to the skill(s) listed in this section rather than the next highest number. A quick and easy checklist to help you spot which skills are present and what’s missing. A chart of all 11 skills with a short description, a one sentence explanation of why the skill is important for language development, and a few beginning strategies perfect for using during visitis with families. A one page handout of SIMPLE IDEAS for EVERYDAY ROUTINES so that families can work on building these skills during things they already do at home. This is a tremendous resource for both parents and professionals. It’s HUGE – 335 pages – but extremely user-friendly. Figure out what you want to work on with a child using the easy checklist, flip to the chapter for that skill, and get busy! The therapy plan is practically written for you! Get your copy today!